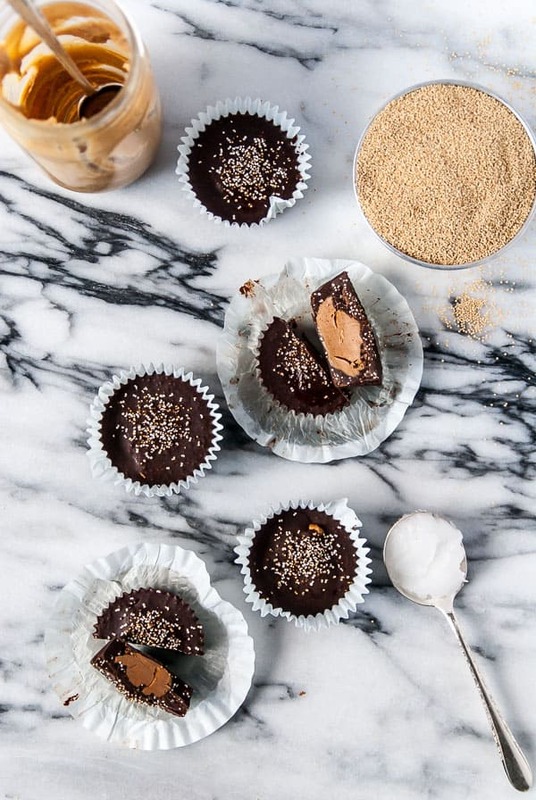 I really should have just gone ahead and named this blog ‘100 Million Ways to Eat PB+ Chocolate Together’, but I’m thinking that would have been too long of a name, right? 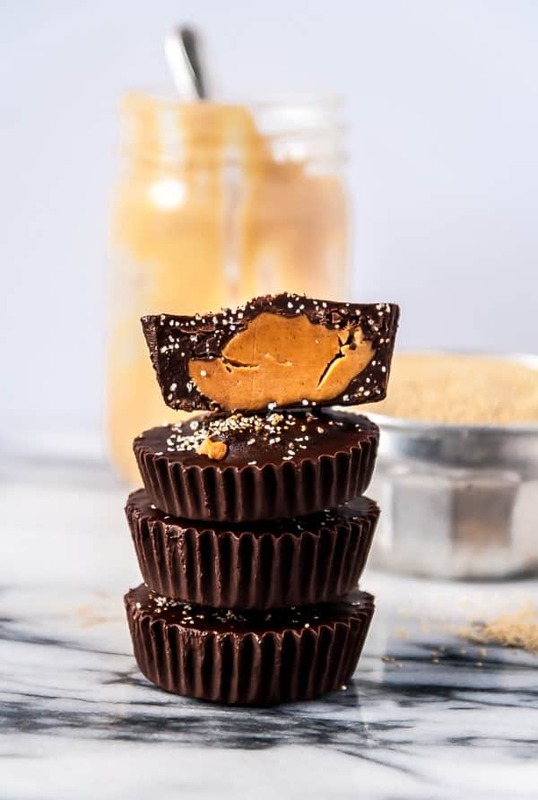 I realized as I was typing up this recipe that I posted a peanut butter and chocolate cake earlier in the week, and now crispy, crunchy perfectly easy chocolate peanut butter cups today. 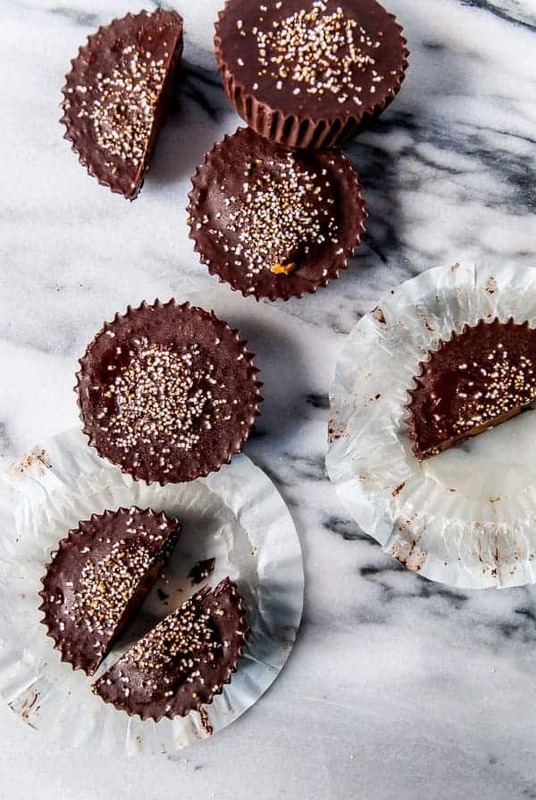 These were actually born out of not knowing what to do with a bag of amaranth that I had picked up from TJ Maxx recently and also wanting to make homemade peanut butter cups, since they are so easy. I knew amaranth could be popped, but I wasn’t sure how easy it was and wasn’t sure if I was qualified to mess with other grains, since I’m quite inexperienced in that yet. Turns out, you only need to burn exactly 1 batch of amaranth to find out your pan is too hot and when you do get the hang of it, the results are quite lovely. 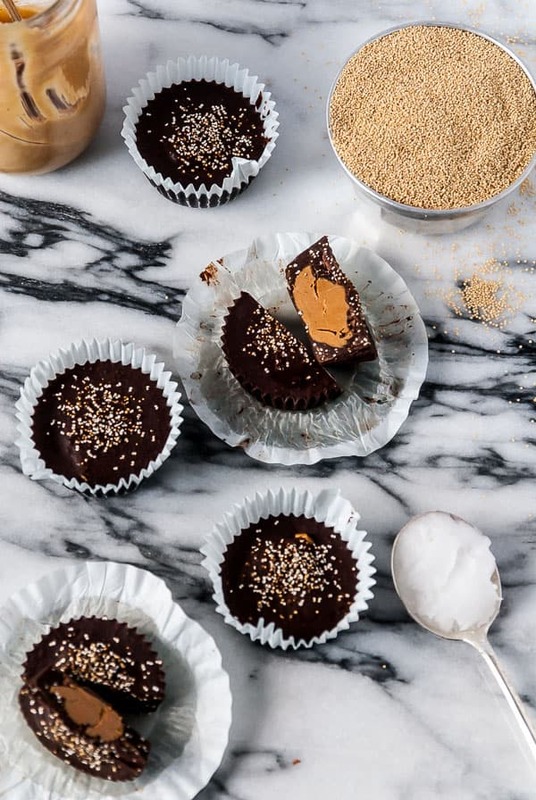 Stirring the puffed grain into melted chocolate and plopping them into some homemade peanut butter cups is super quick and easy, the longest part is waiting for them to set and the hardest is getting the hang of popping the amaranth without burning it all! 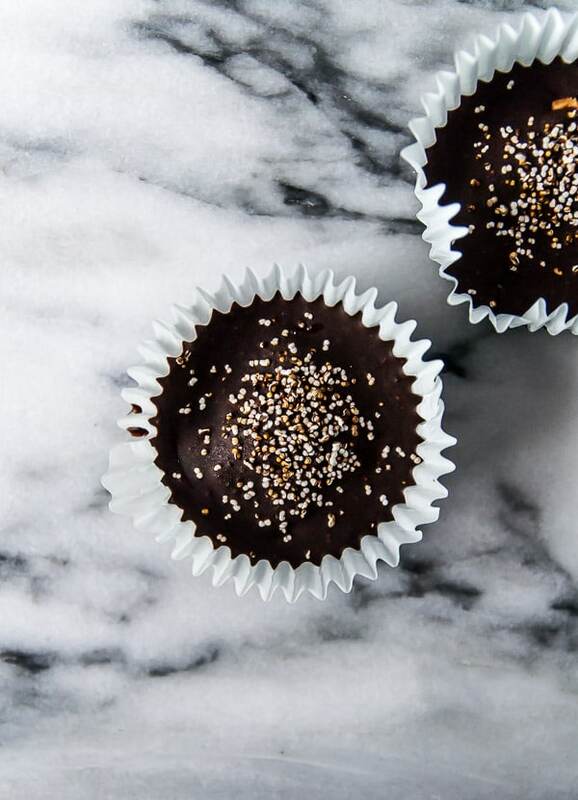 If you want a little twist on the traditional homemade peanut butter cup, these are your jam! As I was making them, I realized they are gluten free as well, so they seem to be pretty much suitable for any friend you have that follows a certain diet or way of eating, since peanut butter and chocolate seem to solve all issues in life. If you have homemade peanut butter, now is the time to use it! Since there are so few ingredients in these, I recommend using high quality stuff in these. Also, if you make a batch and need help eating them, you know where to find me. Keep a super close eye on your amaranth and make sure you don’t let it burn! The good thing is that if it does burn, you are going to be stirring it into chocolate, so it will mask some of the charred flavor. It took me a couple tries to get it juuuust right and start popping. Ashley’s recipe helped a lot when I was popping my batches. Want more peanut butter cups? Double the recipe! 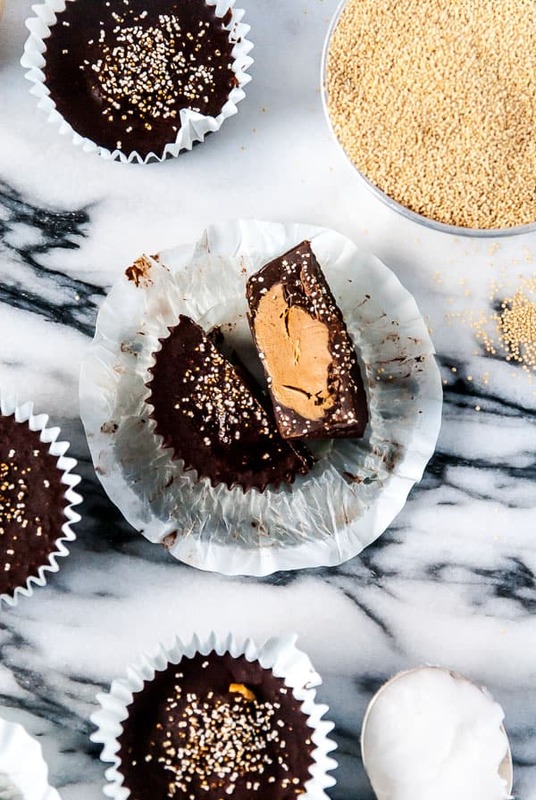 This recipe makes 6, but doubling it would be a breeze and more crispy peanut butter cups= more happy. If you want to add more peanut butter to the filling, feel free! Don’t skip the paper liners! They will make removing the cups from the muffin tin much easier and you could avoid a possible mess if you try to pry them out of the pan. Keep a close eye when melting the chocolate. I don’t use a traditional double boiler method here, but if you are careful enough, you can melt it in a saucepan over low heat. No one likes burnt chocolate, so keep an eye on it. Don’t forget to enter the Rodelle Giveaway from Tuesday’s post! There is a whole pack of goodies up for grabs, including vanilla extract and some awesome cocoa powder from Rodelle. To pop the amaranth: Heat a skillet over medium high heat, add a tablespoon of amaranth and cover with a lid. The grains should start popping right away, you will notice they pop and look like little white beads. If they start browning and smoking, your pan is too hot! Take the grains out, turn down the heat, and let it cool off a bit. Once you get the hang of it, keep popping the amaranth in batches (only pop 1 tablespoon at a time), until all the grains have been popped. Set aside. 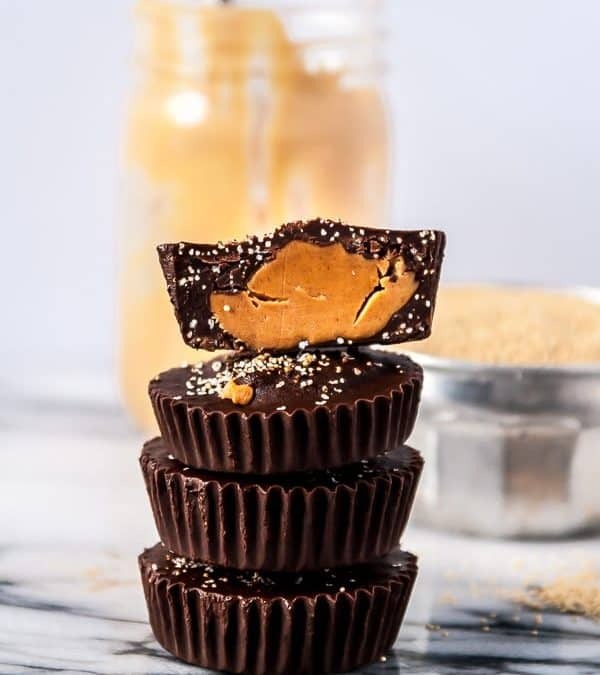 To make the peanut butter cups: In a small saucepan over low heat, melt the chocolate and coconut oil together until smooth and creamy, stirring constantly. Don’t let the chocolate burn! As soon as it is melted, remove from heat. Stir in 3 tablespoons of the popped amaranth. Line 6 cups in a muffin tin with paper liners (I wouldn’t recommend going without these) and spoon 1-2 tablespoons of the melted chocolate mixture into the bottom of each paper liner. Top with a heaping teaspoon of peanut butter, then top with another 1-2 tablespoons of melted chocolate mixture. Repeat until all liners have been filled. Sprinkle with leftover popped amaranth. Freeze for at least 4 hours, or until peanut butter cups are firm. These cups look fabulous! Love that amaranth- such a cool idea. Pinning! 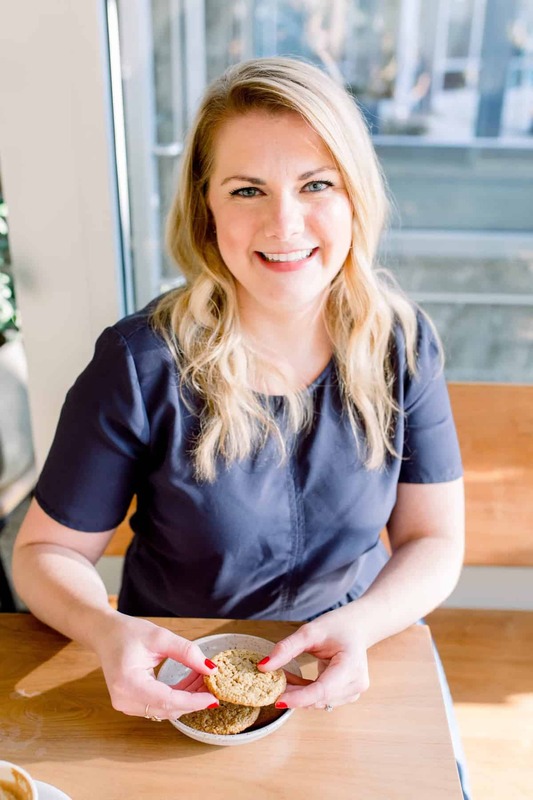 I love that you love PB + C as much as I! I’ve been meaning to make homemade peanut butter cups for ages, so your recipe is lighting a fire under my booty. Loving this popped amaranth idea! Love the addition of Amaranth here Abby! I’ve been meaning to find a good recipe to get using it more than I do, and these are right up my street! Also PB and Chocolate ERRYTHANG would be totally fine by me! So it’s settled, I should just change the blog theme then?! haha! These look absolutely amazing, can’t wait. I’m thinking of a coconut macaroon filling too. Whilst I love a good old plain pb cup (who doesn’t?! ), I love them even more when there’s a little bit of crunch and texture in there too. The idea of using amaranth is just so smart and these sound like a total must make. Who would say no to such a delight? Love the popped amaranth idea, and the photos are delicious! Thank you Ana! I was quite happy with the photos, so thanks for noticing! Perfect way to use that amaranth!!! Love it and love chocolate and pb, so triple love! The amaranth popping is the fun part! I agree, once you get the hang of it, it’s so fun! I’ve mixed popped amaranth with chocolate before and it was awesome. They thought of turning it into a peanut butter cup has to be even better. Pinning! Ohh, that sounds so perfect! Exactly! Peanut butter is all good and chocolate has antioxidants! Yum…just yum! They look amazing and just so you know, I would so read a blog called “100 million ways to eat PB & chocolate”! Haha, maybe I should make a name change then..ha! I absolutely love these! Popped amaranth is the coolest! Right?! I didn’t really believe that it was going to work, but it did! I don’t think I’ve ever actually cooked/baked anything with amaranth. These look like the perfect place to start. Love these! oohhhhh chocolatey and crunchy. I either loved popped amaranth (the texture) or I hate it (annie fighting with getting the burner just right). But for these, the popping part would be so worth it. I’m diggin’ how you were so generous with a huge mound of pb. I need something cold and creamy to wash down all that nuttiness. Oh man, I struggled with the popping for a good half hour or so 🙂 It’s so worth it though! 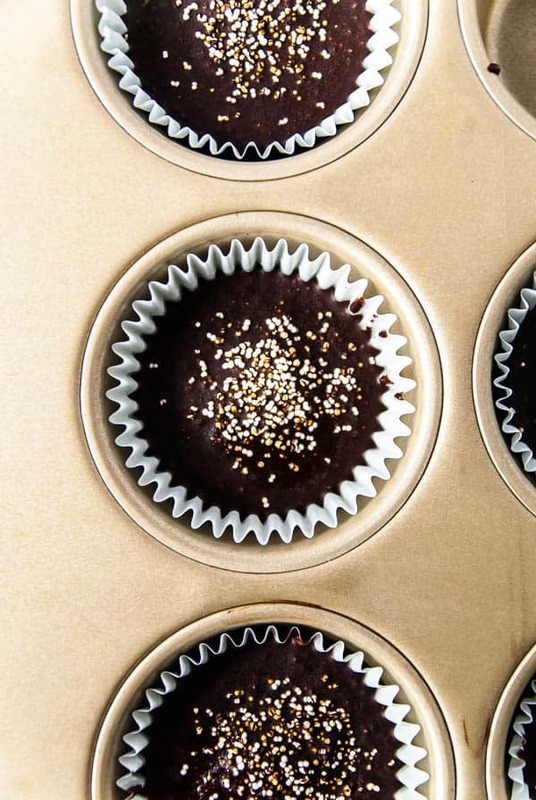 Oh my gosh, Abby, I LOVE the popped amaranth you have on these peanut butter cups! I bet it adds a phenomenal texture to these beauties! Send some over, please?! WOW! These look incredible, and I love the popped amaranth on top. Definitely trying this recipe; thanks for sharing! you are my peanut butter hero. it’s real and you’re mine. Greatest hero award EVER. Come eat another batch with me. Well, let’s see. I just bought a bag of amaranth and thought, now what exactly am I going to do with this? Question. Answered. We have popped amaranth already ready made 🙂 http://www.5-am.co/popped-amaranth Hey, is it okay if you add your recipe to our website?